Latitude and longitude are imaginary lines universally accepted as coordinates for locating places on Earth. 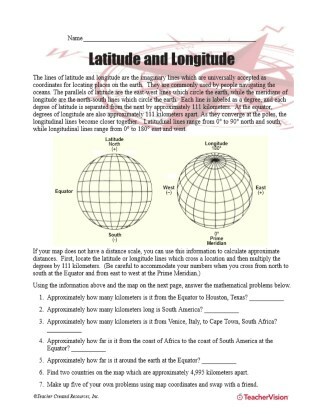 Students can use the map and information in this geography printable to answer mathematical problems and demonstrate their knowledge of map reading skills. This resource is good to use as is or can be modified to serve the purpose of your lesson.